Filling the Gaps In response to student demand, Washington and Lee University has added three new interdisciplinary minors to enrich its curriculum. 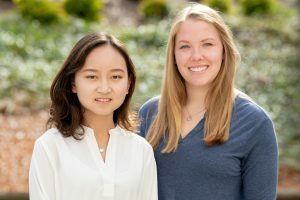 Over the past two academic years, Washington and Lee University has introduced three new minors to its liberal arts experience: archaeology, Middle East and South Asia studies (MESA), and digital culture and information (DCI). Minors in archaeology and MESA were added to the curriculum for the 2017-18 academic year, while this fall is the first time students have been able to declare a minor in digital culture and information (DCI), the newest minor at W&L. The addition of these three minors brings the total number of available minors at W&L to 34. The new minor is designed to enhance students’ academic achievement within any major. Students work together in Assistant Professor Mackenzie Brooks’ DCI class, Data in Humanities. 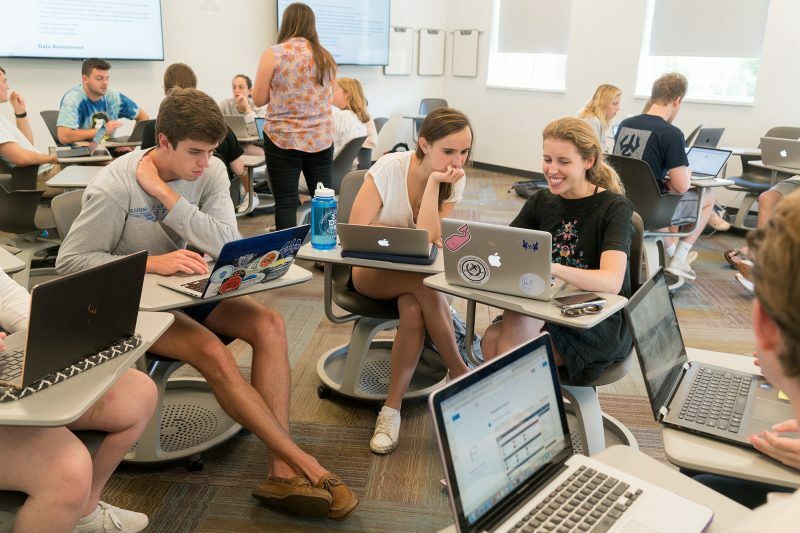 Many of the courses offered under the DCI program were formerly listed as digital humanities (DH) classes as an initiative from the DH committee, headed by Associate Provost Paul Youngman. The committee supported all digital efforts in the humanities through funding opportunities and offering classes that piqued student interest, such as data in the humanities and web programming for non-programmers. He said that as students saw an increase in humanities assignments that involved a data or technology component, they began to request the minor. The DCI program aims to support those students as well as the ones who have never delved into the computer sciences before. This comprehensive, career-focused minor is intended to teach students not only how to use digital tools but also to understand how the internet works. Anthony (Antoine) Edwards, visiting assistant professor of Arabic, and Tim Lubin, professor of religion, proposed the MESA program in September 2017 after Edwards accepted his tenure-track position in July. The university approved the program in October 2017. “The idea behind the MESA program is an interdisciplinary approach to the region of the Middle East and South Asia that explores the historical, economic, political, linguistic and intellectual linkages for this massive region,” said Edwards. The minor has seven courses including art history, religion, politics, humanity, literature and language. It also has a branch for students specifically interested in the Arabic or Sanskrit languages, which require additional credits. Edwards said a “grassroots effort” from the student body made the MESA program possible. Since he started teaching Arabic in fall 2015, students have expressed an interest in better understanding the Middle East and South Asia regions. 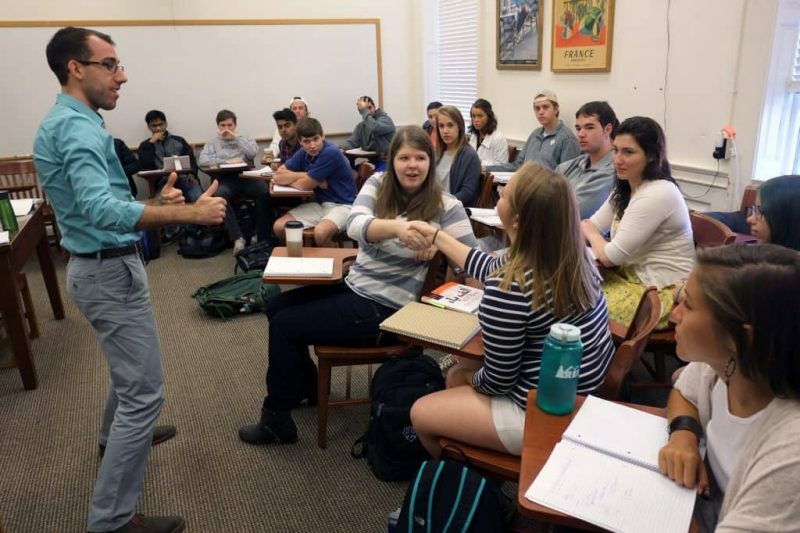 Professor Anthony (Antoine) Edwards works with students in one of his Arabic classes. The MESA minor encourages students to study abroad to learn the subject matter in an environment that differs from the classroom setting. “The minor is like a motivation to push students to go abroad to observe it, to see it, to live it and come back with their own opinions,” said Edwards. Faculty in the program are working to create more independent courses that help improve the structure of the minor. They are also hoping to expand the minor into a major, when the university has more tenure-tracked positions to staff the program. Six students in the class of 2018 signed up for the MESA minor. They were the first class to graduate with the minor. “I hope students who take the minor can be less afraid of the world outside their backyards,” Edwards said. In the 1970s, Anthropology Professor John McDaniel, who has since retired, established archeology as a field program with research projects on the Liberty Hall campus. The program was popular at that time but students had to propose independent majors to gain a degree in anthropology and archeology. Then, in 1989, W&L began to offer a major in anthropology and archaeology, but that major only lasted until the early 2000s, when the university did away with the archaeology major and merged the anthropology and sociology departments into one major. Still, student demand for an archaeology program remained. Gaylord shared his idea of forming the archaeology program with other professors, including Classics Professor Michael Laughy and Sascha Goluboff, head of the Sociology and Anthropology Department. They also talked with faculty in museum studies, chemistry, the Reeves Center and geology, because those are related disciplines in terms of methods and the use of archaeology to reconstruct the past. 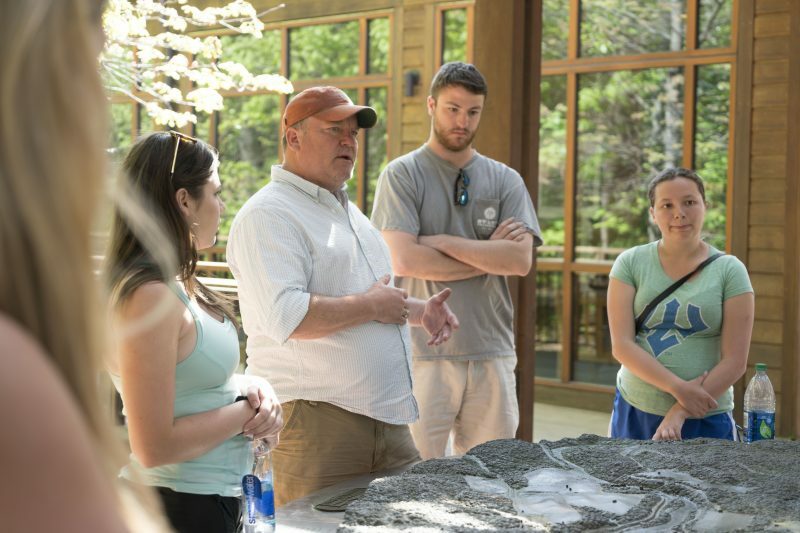 W&L Research Archaeologist Donald Gaylord and his students participate in a tour at Thomas Jefferson’s Monticello. As an interdisciplinary program with liberal arts tradition, the archaeology minor helps students gain experience in both American and classical archaeology. Students now can take American archaeology courses housed in the Sociology and Anthropology Department, including the field projects at Liberty Hall and other sites on campus and around Virginia. Students also can take “old world” archaeology courses in the Classics Department. Faculty in the archaeology program would also like to create an archaeology club, which will be a less formal opportunity for students interested in archaeology. Members of the club would participate in laboratory events and regular meeting of the Archeological Society of Virginia, where they can network with people who have been in the field for a longer time. As the world continues to be transformed by technology, globalization, diversity of culture and political plurality, interdisciplinary studies help students see the world from a more mature perspective. These three new minors continue the W&L tradition of providing students with interdisciplinary opportunities.